Ingersoll, Robert Green (1833-1899) American orator and lawyer born on the shores of Seneca Lake in Dresden, NY, on August 11, 1833, the youngest of five children of John and Mary Ingesoll. His father was by all accounts a stern, uncompromising Congregationalist minister who preached the Calvinist doctrine of man’s innate depravity and his impending damnation. He believed in the words of Elbert Hubbard, that "that which was pleasant was not wholly good". John Ingersoll preached abolitionist sermons so fiery that congregation often dismissed him., Dresden was no exception; the Ingersolls left this area when Robert was four months old. 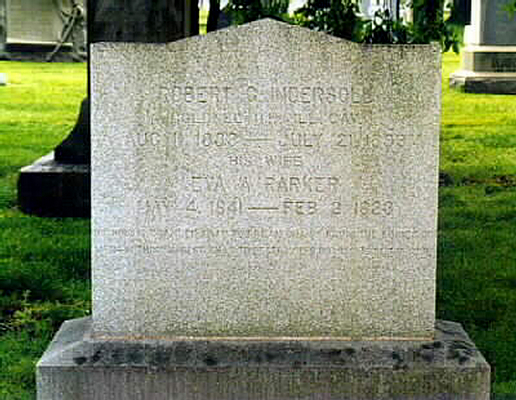 Mary Ingersoll died at thirty-one, when Robert was one and one-half years of age. 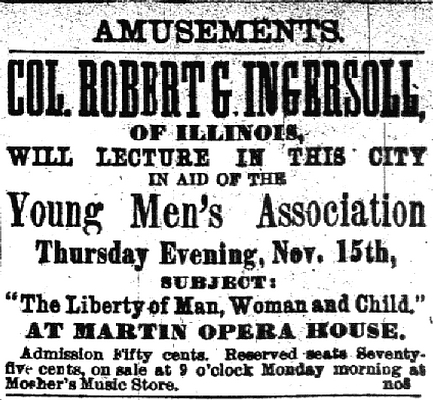 After his wife died, John Ingersoll dragged his family from one ministerial post to another, eventually settling in Illinois. Robert had very little formal education. He last saw the inside of a conventional schoolroom as a youth of fifteen while his family was residing in Waukesha, Wisconsin. Later, he would say that his real education began while he was waiting at a cobbler’s shop, when he chanced to pick up a book of the poetry of Robert Burns. After the family settled in Illinois, Robert apprenticed himself to two lawyers, one after another, and in that way qualified himself for the practice of law. 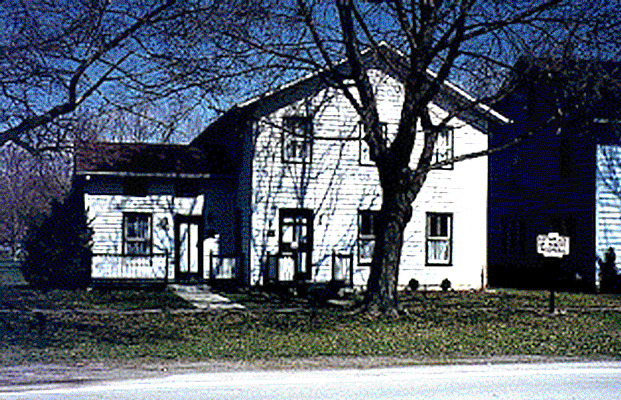 Along with his brother Ebon, Ingersoll was admitted to the Illinois bar in 1854 and they established a law practice in Shawneetown. In 1857 they moved to Peoria, where Ebon started his political career and Robert developed his ability as a lawyer, speaker, and political exponent. He took on some high profile cases such as the Star Route trial, as well as defending a man arrested in New Jersey under an archaic blasphemy law. Though it was one of the few cases he ever lost, he did point out the absurdity of such laws, which were seldom enforced again. He was regarded as a great lawyer with "a remarkable power to go straight to the principle of things." Deeply impress with the writings of such freethinkers as Volney, Voltaire, and Paine, he developed lifelong commitments to rationalism, humanism, and intellectual freedom. In 1862, Robert raised the 11th Cavalry Regiment and was awarded the rank of Colonel. He served with distinction in the Union army during the Civil War where his regiment fought in the battle of Shiloh. Soon after Ingersoll was captured, but as was sometimes done with officers early in the war, he was paroled: allowed to go free on condition that he not fight again. 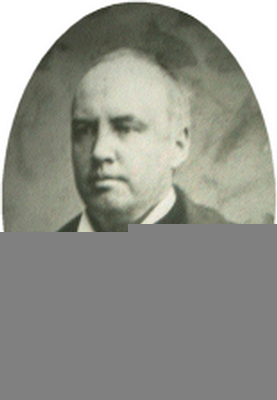 It was during and after the war that Ingersoll built his reputation for oratory. In 1867 Governor Richard Oglesby , appointed him the first Attorney General of Illinois, It was the first and last public office Ingersoll would ever hold. 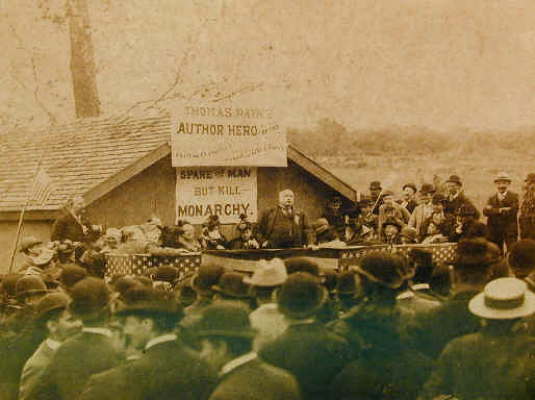 His own political ambitions were thwarted by public disapproval of his attacks on religion, which he delivered in lectures all over the country. Although previously a Democrat, he emerged from the War a Republican,( the party of Lincoln) and in 1876 at the Republican convention he nominated James G. Blaine for President in his famous "plumed knight" speech which contained the following memorable sentence: "Like an armed warrior, like a plumed knight, James G. Blaine marched down the halls of the American Congress and threw his shining lances full and fair against the brazen forehead of every defamer of his country and malinger of its honor." 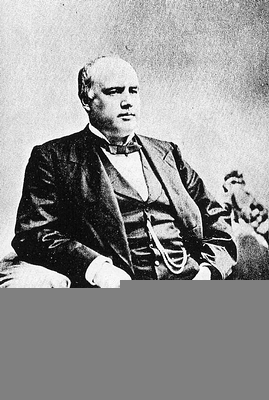 After his brother was elected to Congress in 1879, Ingersoll moved his law practice to Washington, D.C., and lived there, and in New York until his death in 1899. 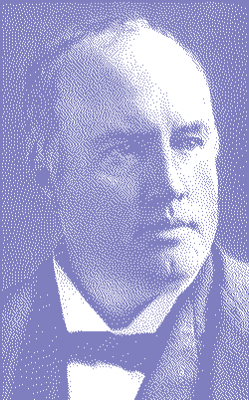 By the latter part of the 19th century Robert Ingersoll was a household name. Though he was first known as a great patriot, he eventually became known as "The Great Agnostic." He stood by the religion of reason and attacked the superstitions of orthodox religions in a common sense style reminiscent of Thomas Paine. A tall, heavyset man with an electrifying voice, he lectured to packed houses across the country, speaking on topics ranging from Shakespeare and science to religion and racism. 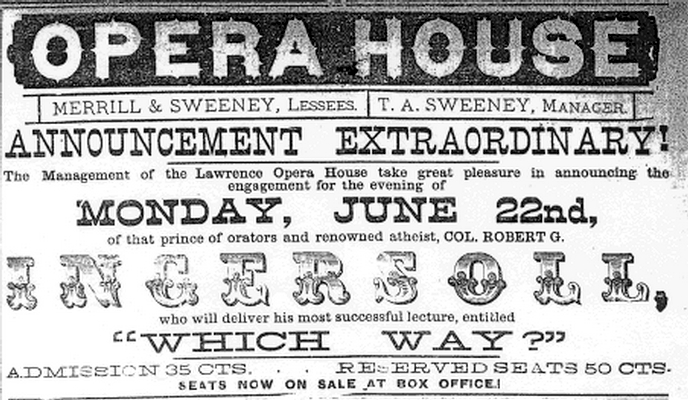 In questioning the tenets of Christian belief his lecture were given such titles as "The Gods" (1872), "Some Mistakes of Moses" (1879), "Why I Am an Agnostic" (1896), and "Superstition" (1898) He could command from $400 to as much as $7,000 (in the dollars of the day) for a single evening’s performance. Ingersoll was admired by people such as Thomas Edison, Mark Twain, Walt Whitmann, Andrew Carnegie and Presidents Ulysses S. Grant and James Garfield, Henry Ward Beecher acclaimed him as the "most brilliant speaker of the English tongue of all men on the globe." He was an early popularizer of Charles Darwin and a tireless advocate of science and reason. More, he argued for the rights of women and African-American. Though his views provoke many death threats, he was undeterred. He was also praised for his virtues as a man of family and fireside. He practiced what he preached. Opponents frequently despaired of finding anything to disparage in his personal life. 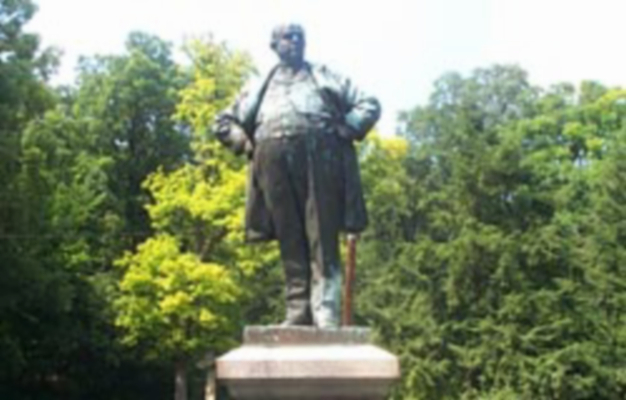 He died of heart failure on July 21, 1899 at Walston, his son-in-law’s palatial home in Dobbs Ferry, New York. He was 65 years old. 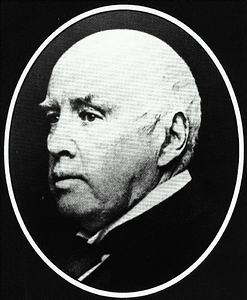 Ingersoll was buried with military honors in Arlington National Cemetery. 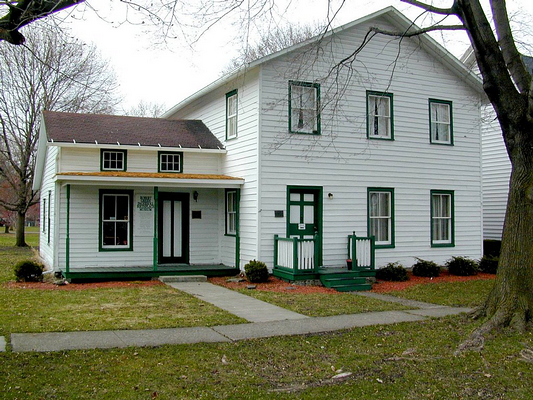 A birthplace museum in his honor is located in Dresden, NY. Shortly after his death, his complete works were collected and published by his brother-in-law Clinton P. Farrell. This lavish 12-volumn set was known as the "Dresden Edition,’ named for the town of Ingersoll birth. "The Liberty of Man, Woman and Child"
"The prejudiced priest and the malicious minister say that I am trying to take away the hope of a future life. I am not trying to destroy another world, but I am endeavoring to prevent the theologians from destroying this. The hope of another life was in the heart, long before the "sacred books" were written, and will remain there long after all the "sacred books" are known to be the work of savage and superstitious men. Hope is the consolation of the world. The wanderers hope for home. — Hope builds the house and plants the flowers and fills the air with song. The sick and suffering hope for health. — Hope gives them health and paints the roses in their cheeks. The lonely, the forsaken, hope for love. — Hope brings the lover to their arms. They feel the kisses on their eager lips. The poor in tenements and huts, in spite of rags and hunger, hope for wealth. — Hope fills their thin and trembling hands with gold. The dying hopes that death is but another birth, and Love leans above the pallid face and whispers, "We shall meet again." Let us hope, if there be a God, that he is wise and good. Let us hope that if there be another life that it will bring peace and joy to all the children of men. And let us hope that this poor earth on which we live, may be a perfect world — a world without a crime — without a tear". O Liberty, thou art the god of my idolatry! In thy vast and unwalled temple, beneath the roofless dome, gemmed with stars, luminous with suns, thy worshipers stand erect! They do not cringe, or ??? ?, or kneel, or crawl. The dust has never held the impress of their lips. Thou askest naught from man except the things that good men hate — the whip, the chain, the dungeon key. Thou hast no popes, no priests, who stand between their fellow men and thee. At thy sacred altar virtue does not tremble, hypocrisy does not crouch, superstition’s feeble tapers do not burn, but Reason holds aloft the inextinguishable torch whose holy light at last will one day flood this world. On February 19, 1886, Joe returned to Shakespeare when he appeared as Orlando in Helene Modjeska’s all-star As You Like It benefit for Polish exiles at the Star Theatre. Both Joe and Louis James, who played Jaques, received notice and praise. Four days later, Joe was back in his beloved Boston, playing Romeo to Margaret Mather’s Juliet. An important new friend and mentor enthusiastically attended these performances. 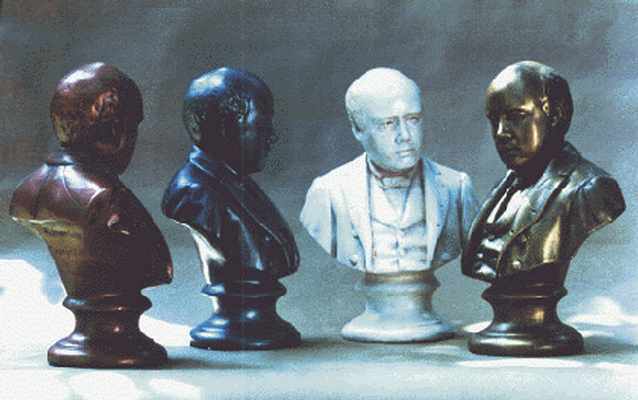 His name was Colonel Robert Ingersoll: war hero, renowned freethinker, and Shakespearian scholar. 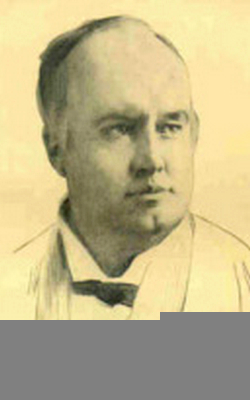 In heavily Christian 19th century America, Robert Ingersoll was a beloved agnostic. He stood squarely for the notion that an individual may lead a moral and productive life without practicing a religion. He was a popular speaker on the lecture circuit---one night in Chicago his audience numbered 50,000. He had seen Joe act, deemed him a worthy exponent of Shakespearean thought, and sought his friendship. Joe became a regular visitor to the Ingersoll family home in Far Rockaway. 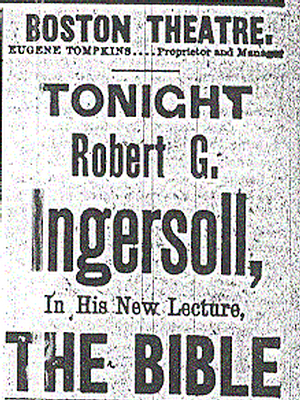 Evenings with Ingersoll and his family were three-hour symposiums. Ingersoll could quote entire plays verbatim. He knew off-hand the differences between folio editions of Shakespeare and quarto versions, and he could elucidate a passage in light of Elizabethan philosophy. When he spoke verse himself, it was simple and musical with the touch of its meaning on every significant word, and with tones changing with the changed feeling. Throughout his career, Joe was consistently praised for his "scholarship." 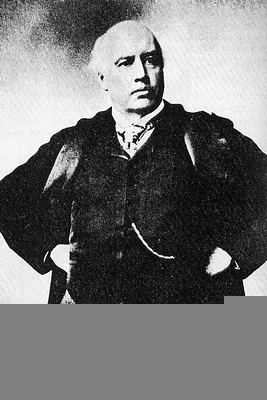 It is clear that his thinking was deepened by the self-taught genius of Robert Ingersoll.